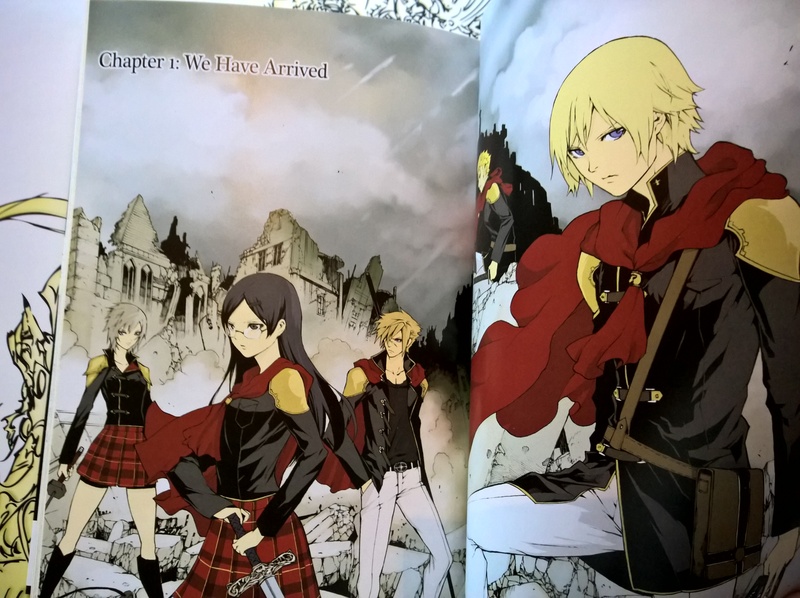 Final Fantasy Type-0 is finally here! Nine years after it was unveiled at E3 2006 and four years after it saw a Japanese release, Final Fantasy Type-0 is finally available outside of the Land of the Rising Sun. Fans have been clamouring for the PSP spin-off, originally called Final Fantasy Agito XIII and conceived as part of Square-Enix’s Fabula Nova Crystallis mythos, ever since it became available for Sony’s PSP in Japan, and for a while it seemed as if it might never come. The PSP was pretty much dead in the west by 2011, and with the Vita stumbling out of the gate, it seemed almost a certainty that the handheld title would never escape its homeland. Thankfully, Square-Enix thought up another plan: release the game on PlayStation 4 and Xbox One as an HD re-release. This may seem a cynical choice, using a much-anticipated handheld title as a means to ensure a decent-sized audience for the real big hitter, Final Fantasy XV – even more so when you consider the free demo of XV that comes with first print copies of Type-0 HD. For my part, I’m just happy we’re getting a game I’ve been thinking about playing for nigh on a decade. And so, I pre-ordered the limited edition. Because of course I did. The limited edition comes housed in a hard box adorned with gorgeous artwork from series’ veteran Yoshitaka Amano, with a slipcover displaying the game’s logo. So what’s in that box? Well, if you’ve paid any attention to the image at the top of this piece, you’ll have a good idea. There’s a hardbound artbook with tons of colourful art and renders – some of which look a little spoilery, so beware if you’re grabbing a copy this weekend. We also have a 200-page manga, with the first few pages in full colour – again, this looks like it might be a bit spoilery, so it’s going to be set aside until I’ve finished my first run through the game. We also have a handful of Ace’s weaponised tarot cards, with art depicting some of the game’s eidolons. These are bigger than your average cards, with a glossy finish to them, and you can see them all in the gallery at the bottom. Last but not least, there’s a beautiful golden steelbook covered in that same Amano artwork that adorns the presentation box. 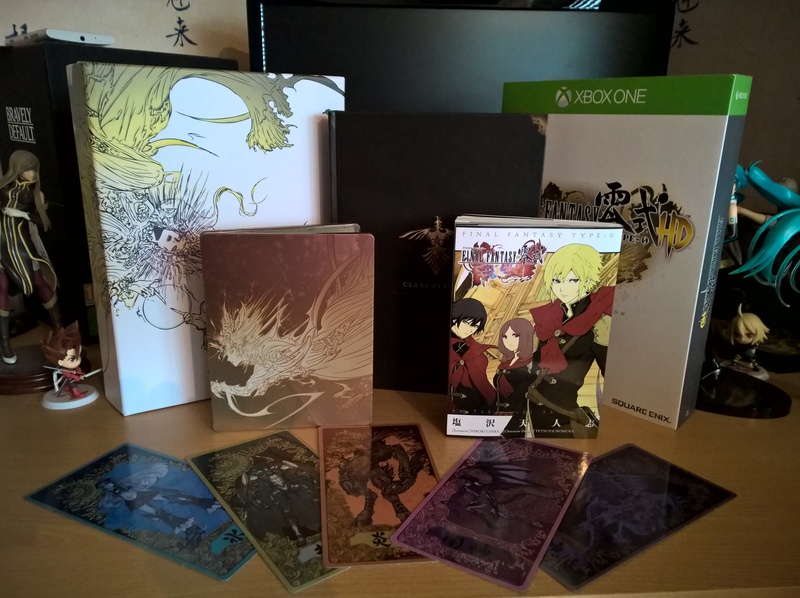 I think it’s probably the nicest steelbook I own, next to the one from the limited edition of The Last Story, and houses both the game and soundtrack selection discs (as well as, of course, a download code for Final Fantasy XV: Episode Duscae). The latter is reasonably generous for a selection disc, holding fourteen tracks from Takeharu Ishimoto’s remastered soundtrack for Type-0 HD, including the suitably epic new theme, ‘Utakata’. I own the original, three-disc soundtrack, so it’ll be interesting to see how the remastered version stacks up. I’m pretty chuffed with this limited edition, even if I feel like I have to steer clear of some aspects of it for the time being – I’ve managed to stay relatively spoiler-free with regards to the story of Class Zero, so now would be a bad time to ruin it for myself. So now, all that remains is to get stuck in and play the game. Especially as my Episode Duscae code doesn’t yet work. And if you’re interested in that, come back in a few days, as I’ll have some thoughts (and video!) discussing it. For more images of the Final Fantasy Type-0 HD limited edition, check out the gallery below.